The Ojibwa were the first Native Americans to use dream catchers. They believe that the night sky is filled with good and bad dreams, and when a dream catcher is hung over the bed, it snares them. The good ones pass through the openings, but the nightmares get trapped in the web only to be destroyed with the rising sun. 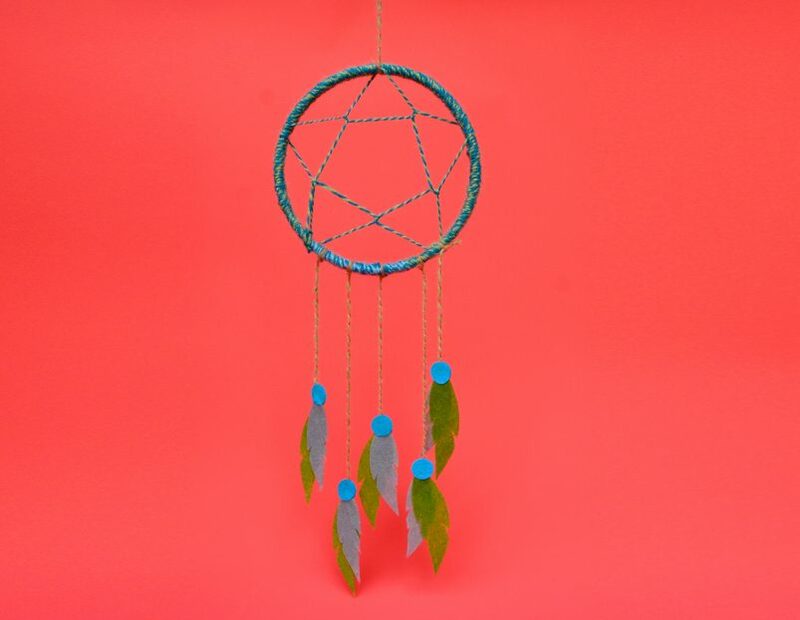 Many other tribes and cultures have adopted this comforting tradition, and lucky for kids, dream catchers are easy and fun activity to make together. Our instructions are for a simple dream catcher, but feel free to encourage kids to add beads, craft feathers, and other decorations you have on hand. 2. Cut a 3- to 4-foot piece of yarn. Knot one end to the hoop. Roll the remaining length into a small ball or bundle (it makes the yarn easier to manage). 3. To make the web, loop the yarn around the frame every few inches until you reach the starting point. At each point, go over the top of the hoop then wrap the yarn around the tight strand you just created. That will help anchor the loop in place. Continue weaving the yarn around the strands, pulling them tight as you go. You can follow a pattern or just do it randomly! When the web is complete. Knot the yarn and trim the ends. 4. Make the tails. Cut several lengths of yarn. Cut small and large feather shapes out of felt. Cut circles and other shapes if desired. Sandwich one end of yarn between two feathers. Glue to secure. Decorate with additional feathers or circles as you like. Knot the other end to the bottom of the hoop. Repeat with the remaining pieces. 5. Tie a loop of yarn at the top of the hoop, then hang your dream catcher over your bed. Craft projects are among kids favorite activities that also teach life skills, including 1) following directions 2) concentration, 3) motor skills & 4) patience.